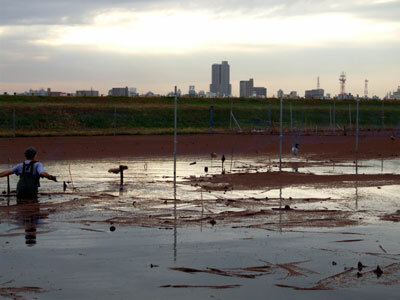 Avi has written at great length about the plight of birds who enter the nets that “protect” the lotus farmers’ fields along the shores of Kasumigaura. To read more about this issue, see the following articles. Today, I decided to shadow Avi on one of his trips to survey the situation and rescue any birds that were caught in the nets. As we pulled up to one of the sites, Avi spotted a duck that was hanging from one of its feet and ran out to rescue it — almost before I could stop the car! He only had one set of hip waders, so I had to watch on the sidelines, but that was probably for the best anyway, as the fields that he had to traverse today were really difficult to manoeuvre in and my short little legs would probably not have been able to propel me forward very effectively. He rescued a small duck and a coot in one field and then we moved along the shore until we spotted a larger duck that was caught up in a net but still actively struggling to get free. The larger duck (a mallard) was located far into one of the fields and it took Avi a long time to reach him. 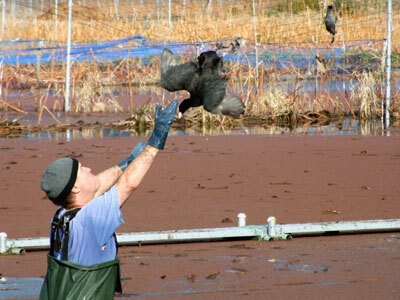 Once the duck was free, he swam away into a neighbouring pond and then flew up and away with a vigorous flap of his wings. 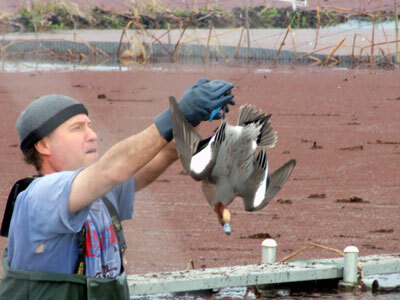 Unfortunately, the smaller duck and the coot did not seem to be very far off from perishing when Avi rescued them. They both must have been hanging upside down for a long time because even after they were rescued, they just sort of sat in the water, dazed. By the time we returned to where they had been rescued, there was no sign of either one of them. We think they both must have died in the interim. Avi says that there is definite progress being made on this issue. Many fields that were completely covered in nets are now either open or only covered on the sides. Also, just as we were leaving, we think we spotted some city hall people who had come to remove the birds and the carcasses. I guess it is a bit of an embarrassment for the city to have a bird mortuary on the shores of one of their biggest tourist draws. However, there is still work to be done. We saw many, many carcasses of birds who had gotten stuck and perished, and Avi assures me that I only saw a very, very small percentage of the fields today. It is important not to let people forget that so many birds are out there hanging from their feet or wings, starving (or freezing) to death. 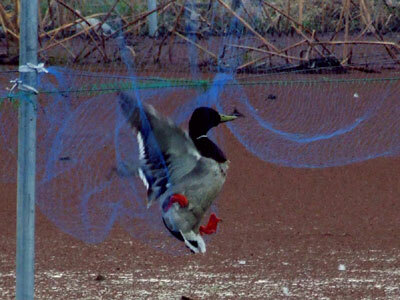 The worst part of it is that the nets are not even effective at keeping the birds out! 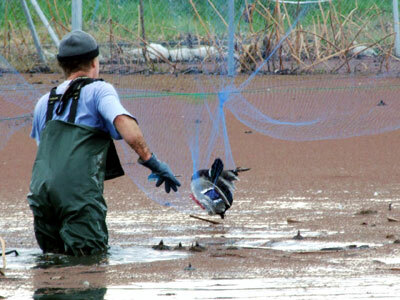 The fact that the birds get inside the nets is proof enough of that fact, but even worse is the fact that some of the birds can also fly out of the nets — proving that the nets are not really effective at keeping the birds away at all. If you have some time to spare, I would urge you to contact Avi (avi[at]tora.email.ne.jp) and volunteer to go out to Kasumigaura with him. If you are strong enough (and tall enough), you can help him with the rescuing, but if you aren’t, you can help by taking photos, getting the word out to your friends, helping to find ways to publicize this issue in the Japanese media or on blogs, translating information into Japanese, etc. As with any animal-welfare issue, the faster you offer to help, the fewer animals end up suffering.